Big Little Dipper Dipper contains three or more of the following: Oliver Orion, Caitlin Rippey and Jason Webley. Dance club hits, ballads and party music from the 1990's of the future. 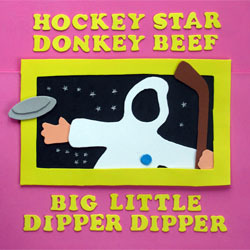 This EP is Big Little Dipper Dipper's big comeback after their non-existent debut Chinese Donut Commercial. If the project seems like an in-joke, please rest assured that it is not - we don't understand it either. These songs are just what happens when I get together with my friends Oliver Orion (songwriter, boatbuilder, eater of crazy things) and Caitlin Rippey (artist, scientist, mold grower). This is also probably the most fun I've ever had making a record. This is the newest in a series of eleven collaborative projects between myself and songwriter friends from around the world. Only 1,111 numbered copies of this disc will ever be made. They generally go out of print rather quickly.